Can real-time updates protect our connected cars? This is a contributed article by Andrew Till, Vice President, Technology, Partnerships & New Solutions, at HARMAN Connected Services. We are currently sitting on the verge of an explosion in the number of connected vehicles on our roads. Figures released last year by Juniper Research predict that in five years’ time, connected vehicles will generate as much as 98% of mobile-to-mobile data traffic. [i] As has already happened with smartphones, consumers are likely to become dependent on connected and driverless, cars, as the convenience is too great a pull to ignore. However, just as with all new technologies that scale quickly, there will almost certainly be a need to ensure software is regularly updated to prevent vulnerabilities from causing problems later on down the line. It is therefore vital that vehicle manufacturers put in place provisions such as real time updates to ensure software can be quickly updated. One such provision is Remote Vehicle Updating Services (RVUS) powered by Over-The-Air (OTA) updates which will ensure that vehicles are securely connected and software can be easily managed. Being able to monitor and analyse software across all devices will also be possible with this technology and become essential for Original Equipment Manufacturers (OEMs). By being able to manage all connected devices, regardless of pre-existing networks, device platforms or operating platforms will provide direct benefits to consumers and OEMs alike. Are Remote Vehicle Updates (OTA) secure? At present, many of the advanced in-vehicle features consumers enjoy and rely on are software-based. For this reason, a very common question for both consumers and manufacturers is: can a car be hacked? 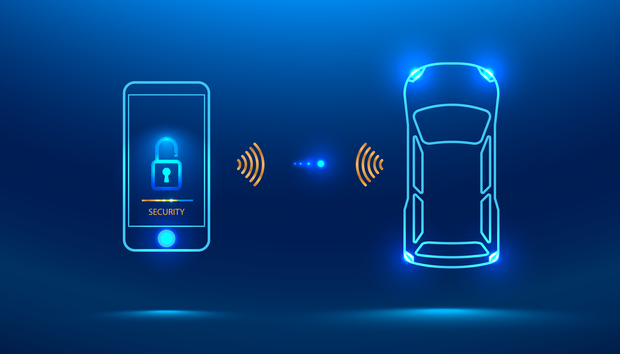 However, as scary as the potential consequences of cyberattacks on vehicles are, software and hardware features can be managed effectively to reduce this threat. The use of RVUS and OTA can provide instant updates continuously and have the ability to address issues or necessary upgrades in real-time, leaving virtually no room for software bugs to be capitalised on. One added benefit of RVUS for OEM’s is the ability for it to retrofit software onto any vehicle and without the need for significant hardware investments. As such an un-connected vehicle can quickly become connected, and reap the benefits that this offers. With this service, there will no longer be a need for direct contact with internet-connected telematics units, and as such will help reinforce the security of vehicle software updates. Furthermore, RVUS offers OEM’s the benefit of reducing maintenance by monitoring parts and correctly predicting when they will need to be replaced or serviced. This also helps ensure cars are operating at full efficiency for more of the time. As a result, OEMs can use OTA as a way to offer a competitive advantage and further build the customer relationship. Another example of how RVUS can improve user experience is with real-time mapping updates. Utilising sensor technology, OTA enables real-time updating of map data for embedded navigation and advanced driver-assistance systems (ADAS), further boosting their accuracy and worth to a driver. In addition to delivering accurate GPS information, OTA powered RVUS can help provide advanced warning to drivers of speed limit changes, approaching accident scenes and other traffic alerts. Furthermore, RVUS can also save customers money by reducing the need to visit the garage as much. With OTA updates able to quickly adjust and alter many aspects of a vehicles system, it can remove the need to manually adjust elements of a car, helping save owner’s both time and money. In addition, by having a car regularly updated, safety performance can further be improved as new software programmes are designed and developed. Why OEMs need an OTA strategy? Driver safety and convenience are not the only benefits of RVUS. OEMs also stand to profit from improvements in their ability to better maintain connected car features over the course of a vehicles life. With RSVU OEMs are able to deliver updates almost regardless of where a vehicle is. As such, vehicles can be anywhere from a production line, at dealerships or on car owners’ driveways, RVUS allow OEMs to remotely manage software-driven components, including firmware, applications, configurations, settings and maps on head units, ECUs (Electronic Control Units) and TCUs (Telematics Control Units). A great example of the advantages OEMs using RSVU are able to achieve is in the reduction of production time during a vehicles manufacturing process. With RSVU remote vehicle updating helps increase production line efficiencies by reducing the time currently allocated for software flashing. The large amount of megabytes of code inputted in ECUs in connected cars requires a flashing window on the production line. By using RVUS, once the battery and the TCU are connected to the internal Controller Area Network (CAN bus); any ECU that is connected can be updated and flashed remotely at any given time, thereby speeding up the whole production process as cars can be updated away from the line. Overall, though it is clear that through optimising operations on the backend, OTA delivers better experiences for both OEM’s and customers. Simultaneously it allows OEM’s to uphold their brand reputation and help to build customer loyalty with fewer recalls and expensive hardware and software issues.